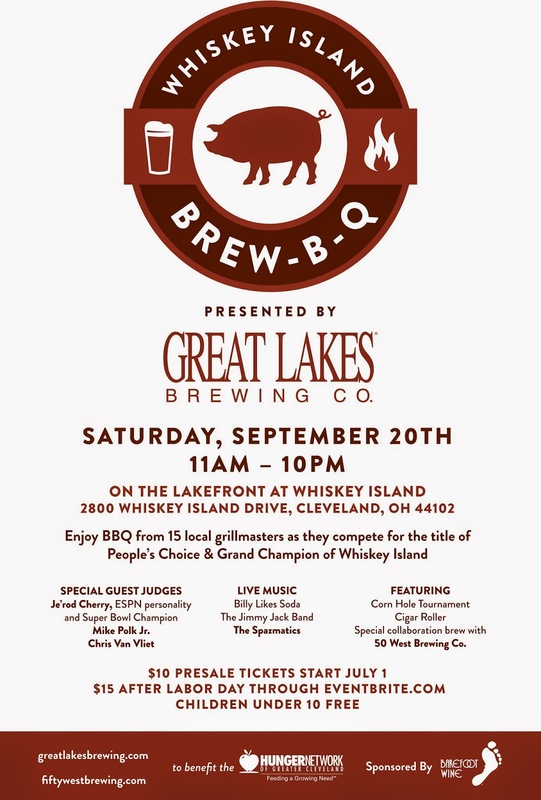 A fun event is coming to Whiskey Island on Saturday, September 20th--- Brew-B-Q, presented by Great Lakes Brewing Company. All proceeds will benefit The Hunger Network of Greater Cleveland. From 11AM to 10PM, attendees will enjoy classic barbecue food from 15 vendors, lakefront views, live music, a cigar roller, and a special collaboration brew from Great Lakes and 50 West Brewing Co. Ticket are just $10, and children under 10 are free. You can purchase them online here. Great Lakes Brewing Co. is also hosting a pre-sale event at the brewery today, September 11th. Or, you can win two passes! Use the Rafflecopter giveaway below, and you can be entered to win. A random winner will be selected on Monday, September 15th. Disclosure: I was provided with four tickets to the Brew-B-Q event by The Hunger Network of Greater Cleveland in exchange for a giveaway post and event review post. All opinions stated are 100% my own. BBQ and Beer?!! Sounds like an amazing event! Any kind of barbecued pig! I'm not picky, as long as it's done well!